In 1953, three Americans were murdered while bear hunting in the Gaspé region of Quebec, Canada. Wilbert Coffin, a mining prospector, was tried, convicted (for one of the murders) and sentenced to death. 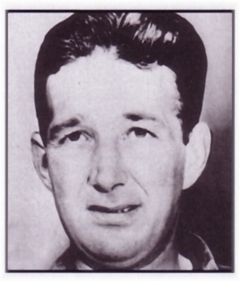 In 1956, Wilbert Coffin was hanged in Montreal, Canada. Plagued with controversy and public disapproval, all eyes turned to the Gaspé. The Coffin case gained national attention, with numerous investigators of the case arguing that Coffin, as he proclaimed to his death, was innocent. Although the case played an instrumental role in the abolishment of the death penalty in Canada, Coffin’s name has yet to be officially cleared. Wilbert Coffin’s final words were, “Into thy hands Lord, I commend my soul”. In late 2003, I began writing “The Wilbert Coffin Story”. Being a Gaspesian, I grew up hearing stories about the Coffin case, so it is a very natural subject for me to write and sing about. The song opens with a personal story that was told to me by my father. My father was about 5 years old when he witnessed Wilbert Coffin in handcuffs being escorted by police into a garage to use the washroom while on route to the courtroom in Perce. The opening lyrics read: “My daddy seen him, with shackles on his hands, He was young but knew who it was, all the talk was of this man”. Before recording the song, Richard Element (co/writer) and I made a trip out to Sherbrooke to meet and chat with Alton Price, author of To Build A Noose, a book which details the case for Coffin’s innocence. The song (then titled Justice Precluded Coffin) was included as the only acoustic track, sort of a bonus track, on the Dale Boyle and the Barburners’ electric blues/rock flavoured A Dog Day For The Purists (2004) CD. 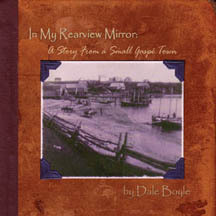 I felt the song needed to be on an album that was more fitting with the folk storytelling genre, so a new version, under the title, The Wilbert Coffin Story, was recorded for my solo acoustic folk roots album, In My Rearview Mirror: A Story From A Small Gaspe Town (2004). I have performed and told “The Wilbert Coffin Story” on a CTV Montreal news special and a CBC ENJEUX documentary film. < Click for video clips of Dale performing "The Wilbert Coffin Story" on the CBC Enjeux documentary on the Wilbert Coffin case. But have you ever been in the wrong place at the wrong time? "Lord I, I commend my soul"
Trois Américains morts, tués en Gaspésie, un pauvre garçon va payer. Avez-vous déjà été au mauvais endroit au mauvais moment? Et il a dit . . .